Happy Halloween! The Magic Kingdom hosts a great event known as Mickey's Not So Scary Halloween Party on many nights throughout September and October. This picture of our little man, dressed as Buzz Lightyear, was from the party a few years back. The guests can actually trick or treat through the Magic Kingdom and receive candy from many locations around the park. There is a special parade that takes place during the party that starts with the Headless Horseman riding a horse along the route. There is also an incredible fireworks show known as Hallowishes. In my opinion, this is the best fireworks show of the year. I definitely recommend checking out Mickey's Not So Scary Halloween Party if you are vacationing at Walt Disney World during this time of year! In continuing with my Haunted Mansion theme for Halloween week, I certainly had to post a photo of the pet cemetery that is located at the exit of the attraction. This is a "scene" that many guests walk past without even noticing. My favorite "stone" actually pays homage to a Magic Kingdom attraction that closed back in 1998. It is difficult to see, but you can spot a dark colored toad in the left rear corner next to a brick pillar. This was placed here in 2005 to honor the "death" of Mr. Toad's Wild Ride. There was no official announcement by Disney management, and it is rumored that this tribute was placed there by cast members without permission. However, it has survived for seven years, so I'm sure that the people in charge appreciate or at least accept it! As Halloween approaches, I thought it would be fun to post a Haunted Mansion picture. This straight on shot shows some of the fun exterior features of the "gothic" home. Way up on the roof, you can see that the weathervane is a bat. On either side of the front door you can see the posts are made of coffins. The door itself has a black wreath on it. Back in the 18th century, this would indicate that serious illness or death exists inside. Finally, the flower planters are actually made of cremation urns. This attraction is full of great details and amazing effects, both inside and out. That is the primary reason it is my favorite attraction. The Honey I Shrunk the Kids "Movie Set Adventure" is a fun place for kids to run around and expend some energy. It is themed after the 1989 movie and includes 30 foot tall blades of grass and other giant props. This playground makes kids feel like they are the size of ants. Parents can relax for a bit while the children enjoy themselves. You can find this attraction in the Streets of America section of Hollywood Studios. I'm jumping from 1984, in my last post, back up to this month. We go from a grainy picture in front of an extinct railroad station to a crystal clear shot in Adventureland. I will always have an affinity for "old school" and extinct attractions at Walt Disney World, but nothing beats the quality of a digital picture taken in 2012. I love Adventureland on a sunny day. It is so lush and tropical, and there is a real island feel prevalent throughout the area. When I took this shot, I was standing in front of the Pirates of the Caribbean looking toward Walt Disney's Enchanted Tiki Room. The thatched roofing on that building has a very authentic look. However, since Central Florida is the lightning capital of America, the thatching is actually made of sheet metal strips to avoid the possibility of fire. Although I usually post pictures from recent tours that I've given, tonight I decided to go old school. While recently watching an old home video of a Walt Disney World trip from 1984, I caught a glimpse of something that I didn't immediately recognize. For a few seconds, the old Frontierland Railroad Station was in view. Although this is a grainy photo that I snapped off the video, I though it would still be a fun one to post. This station opened in May of 1972, only seven months after the Magic Kingdom opened. For more than 18 years, there was a very large grassy area in front and to the right of the station. Can you guess what sits on this spot now? If you guessed Splash Mountain, you know your Magic Kingdom geography. Splash Mountain opened on October 2nd, 1992 and filled in the gigantic open area that once sat between the railroad station and Big Thunder Mountain. The new railroad was built in between Splash and Thunder and is basically attached to Splash Mountain. When watching these old videos, it is amazing how much the landscape has changed over the years. 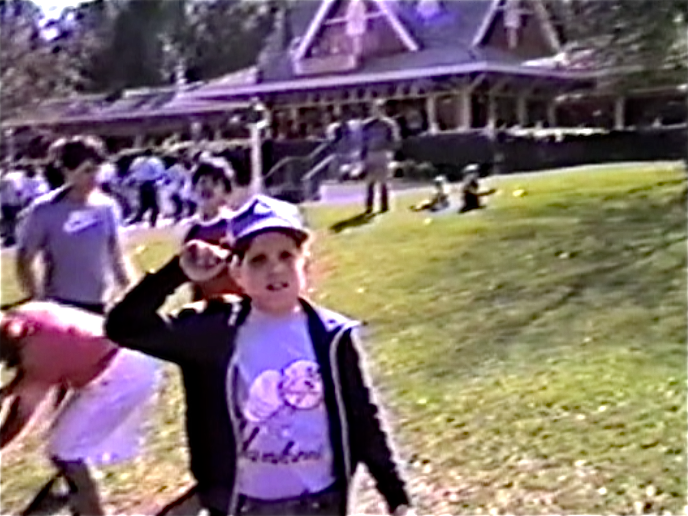 Incidentally, the "cool" 12 year old kid in this shot, with the mesh Mickey Mouse hat and the Yankees tee shirt, is yours truly. While walking through the Germany Pavilion a few weeks back, I observed something that I don't remember seeing in the past. This clock tower that is situated toward the back of Germany came to life. It was exactly 7:00 pm and the bell was struck seven times. Much like the famous Glockenspiel in Munich, two Hummel figurines came out from behind the doors. I quickly snapped a few pictures and got this shot just prior to the doors closing. This reminds me of the clock over in "it's a small world," where if you catch it at the right time, you get to see a little show. As I mentioned in last Saturday's post, Disney just put the finishing touches on the Storybook Circus section of Fantasyland. Along with Big Top Souvenirs and Pete's Silly Side Show, they also erected this tent in the back left corner of the area. It contains the FASTPASS distribution machines for The Barnstormer and Dumbo. Disney did a nice job in keeping with the Circus theme throughout this entire section of the park. The area where I was standing to take this picture had many small tables and chairs set up. It is a nice spot to eat a treat from Big Top Souvenirs or just relax for a little while. I took this picture back in September while giving a tour of Hollywood Studios. I really enjoy showing guests this park because of the amazing amount of detail to be found. This shot was from the waiting area of Mama Melrose's looking toward the dining area. There are four "hidden Mickeys" in this waiting area. You can see one of these (colored in red) at the far left edge of this photo. The American Adventure at Epcot is an amazing tribute to the history of our great nation. The video starts during the Golden Dream montage and captures the finale of this moving show. I recorded it back in April of this year (2012). It was the last show of the night and there were only two of us in the giant 1,000 seat theater. During this Presidential election season when so many Americans are bitterly divided in their politics, the American Adventure reminds us that we are so lucky to live in this great country. No matter what the outcome of the election, we will remain united as a nation, and we will always keep moving forward! This shot of Mr. Incredible comes from the "Move It! Shake It! Celebrate It! Street Party." This lively "mini parade" takes place several times a day and includes traditional Disney characters as well as Pixar favorites. The performers have a ton of energy and interact well with the guests. The parade route starts in the same spot (near the Harmony Barber Shop) as the big afternoon parade, but after reaching the hub it returns back down Main Street and exits at the same spot as it enters. It lasts about 15 minutes and is certainly a favorite of young kids. As a side note, my son is a big fan of Mr. Incredible and he will be dressing like him for Halloween! The Mariachi Cobre is a traditional Mexican Mariachi band that performs daily in and around the Mexico Pavilion at Epcot. Although I just took this picture a few weeks ago, this group has been playing here since Epcot opened back in 1982. There are actually four members of Mariachi Cobre that have been part of the band since opening day and have now played here for over 30 years! They have literally entertained millions of guests in that span of time. Although we may never know their names, it is probably safe to say that they have played in front of more people than most popular musical artists of our time. I always love when I can see brand new attractions shortly after they open. Pete's Silly Sideshow opened on a Sunday and I was able to get there on Wednesday. This "big tent" over in the Storybook Circus area of the Magic Kingdom is home to four new character greetings. Guests can see Goofy, Donald, Minnie and Daisy at this location. Of course, they are part of the "circus" in this area of the park so they each have stage names. As you can see here, Donald is known as the Astounding Donaldo - Snake Charmer. Storybook Circus, which first opened back in March, now appears to be complete. Although Mickey's Toontown Fair was a popular area of the park, I really think guests will enjoy the transformation that took place here. While giving a tour of Epcot a few weeks back, I caught this "scene" out of the corner of my eye and couldn't believe what I was seeing. There was an actual cranberry bog set up right in the middle of the walkway between Future World and the World Showcase. Of course we had to approach the area and chat with the man who was thigh deep in a huge pool of cranberries. While standing there in his waders, he described for us how cranberries are harvested in a real bog. This, of course, was part of the Epcot International Food and Wine Festival and not a permanent addition to the park. It was sponsored by Ocean Spray and they were handing out free "Craisins" in a booth nearby. Taking a dip in a resort pool is a great way to spend a hot afternoon at Walt Disney World. However, it is also a nice way to end a long day in the parks. This nighttime shot, taken at the Beach Club Villas, is an example of how quiet the pools can be when most people are back in their rooms for the night. For about six months out of the year, the temperatures are still very warm at night and the pools can be very refreshing. This is one of my favorite resorts as it has a relaxing atmosphere while still being very close to Epcot. In fact, this is the closest resort to any theme park, and from this spot you can be enjoying the World Showcase in only five minutes. Mouse Gear is the largest Disney merchandise and apparel shop in Epcot. This huge 25,000 square foot store opened back in September of 1999. There are some interesting props that can be seen throughout Mouse Gear, including parts of Dreamfinder's blimp from the original Journey Into Imagination attraction. Prior to 1999, this spot was home to another gift shop known as Centorium. It included two stories of merchandise with a large staircase and an elevator. This panorama was taken a few weeks ago from one of my favorite spots in any Walt Disney World park. I was in the lower seating area for the Flame Tree Barbecue at Animal Kingdom. This spot is a hidden gem that many guests don't know about. In addition to the breathtaking view, it is usually a pretty quiet spot to get away from the large crowds. This view of the tallest mountain in all of Florida highlights Disney's use of forced perspective. First off, Expedition Everest is just under 200 feet tall. The main reason they don't build above that height is that a flashing red beacon would be required for aircraft avoidance. What many guests also don't realize is that we aren't looking a replica of the real Everest. It does represent the Himalayas but the snowcapped peaks in the foreground are atop the "Forbidden Mountain," which is part of the fictional story created for the attraction. However, the barren peak on the right actually does depict Mount Everest in the distance. The reason that it isn't snow capped is because the winds are typically so strong on the 29,000 foot summit that snow just blows right off! Splash Mountain Gift Shop - The "Briar Patch"
I took this shot at the end of a full-day tour of the Magic Kingdom last week. The Splash Mountain gift shop, known as the "Briar Patch" is very well themed to fit in with the rest of the attraction. It gives you the feel of being in the ground with the roots of the briar patch forming the ceiling of the store. There are some great little "scenes" set up along the edge of the ceiling that give the appearance of rooms you would find in a home. Even if you don't plan on buying anything, the "Briar Patch" is a great little spot to visit after riding Splash Mountain. I took this panorama shot while giving a Magic Kingdom tour last week. I was standing on the little bridge that is directly above the "starting line." This is a great spot to get pictures of my guests just before they drive underneath me. The panorama feature allowed me to capture the grandstand on the left all the way over to the maintenance area on the right. The Tomorrowland Speedway has 146 cars that are each valued at $6,000. Although they aren't exactly speedy at 7.5 miles per hour, they are definitely fun for young drivers. 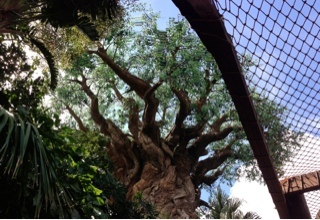 This shot of the Tree of Life was taken last week from the exit walkway of "It's Tough to be a Bug." This is an area that gives guests an up-close view of some of the 325 animals carved into the trunk of the tree. The netting overhead the walkway was added quite recently. Apparently a small branch fell from the tree during some overnight maintenance. Disney probably felt that constructing this netting would be a prudent guest safety measure. Unfortunately, it does take away from the natural surroundings. However, it isn't too bad and new guests to the park will probably just figure that it has always been there. When I started this website, I was focused on writing about ways that we could use modern technology to stay connected to Walt Disney World. In addition, I have discussed how technology has helped guests have a better experience while actually visiting the parks. Digital Disney World has evolved quite a bit over the past two years, and I've added several new features along the way. Although I plan to continue occasionally writing about "modern technology," I've covered a majority of the current websites, apps, podcasts, and blogs in the 120 articles that I've posted so far. Anyone who has been following Digital Disney World over the past few months can see that I've focused most of my efforts on using the "modern technology" of digital photography to post a daily dose of Disney magic. Although I have been posting the "DDW Pic of the Day" for over a year, there has been a new twist of recent times. Even though I have over a decade of photos in my Disney collection, most of the new pictures you see on the site were taken a short time before they were posted. In many cases, they were shot the very same day. Also, I have been including a little more information about the subject of the photo. Whether it be an interesting fact about an attraction or just a friendly tip, I've tried to add a little substance to each post. This is also true for the YouTube videos I continue to record and feature on the website. There are several reasons for the transformation of Digital Disney World. First, I have been very blessed to have had a successful year in my WDW Guided Tours business. Since I've been spending so much time on Disney property, I thought it would be fun to share current pictures that I've been taking on a weekly basis. Second, since I've already covered so many of the modern technology topics, this subject doesn't really warrant regularly scheduled articles moving forward. However, I will continue to occasionally write about technology as I discover new websites, apps, blogs, etc. Finally, my shift into focusing on photography was fueled by a piece of technology that I've discussed many times over the past two years. Of course I'm talking about the iPhone. Some of the pictures I've posted were shot with an iPhone 4S, but a majority were taken with a decent point-and-shoot camera. However, the iPhone 5 has helped me transition completely into cell phone photography, and nearly all of the pictures you see going forward will be taken with this device. If you were to tell me just two years ago that I would be using a phone to take all of my pictures, I would have said you were crazy. However, the 8mp camera on the new iPhone simply does an amazing job. It also includes an incredible panorama setting that I've started using at Walt Disney World. I plan on featuring many of these panoramas in my DDW Pics of the Day. In addition, I have also started taking all of my videos with the iPhone as the HD quality blows away my handheld camcorder. I will continue to record videos for my YouTube channel and post them to Digital Disney World. I want to conclude this article by thanking you for following Digital Disney World. I really appreciate the feedback and emails that I get from my readers. I hope you continue to enjoy a daily visit to the Vacation Kingdom. I feel very lucky that I've been able to enter the Walt Disney World online community with this blog, and I've met so many great people because of it. Through this process, I have been able to start my own Disney related business and follow the dreams of my childhood. For that, I will be forever grateful! On September 15th, the final wing of the Art of Animation opened. It is themed to the Little Mermaid and is the only section of the resort that has standard rooms. The other three areas contain family suites. 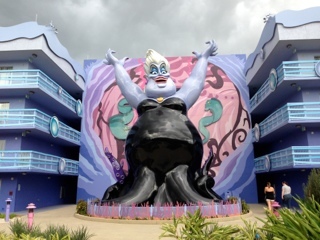 This giant Ursula is only one of the "larger than life" figures found in this wing. There was a large thunderstorm looming in the area, which provided an appropriate background for this shot. 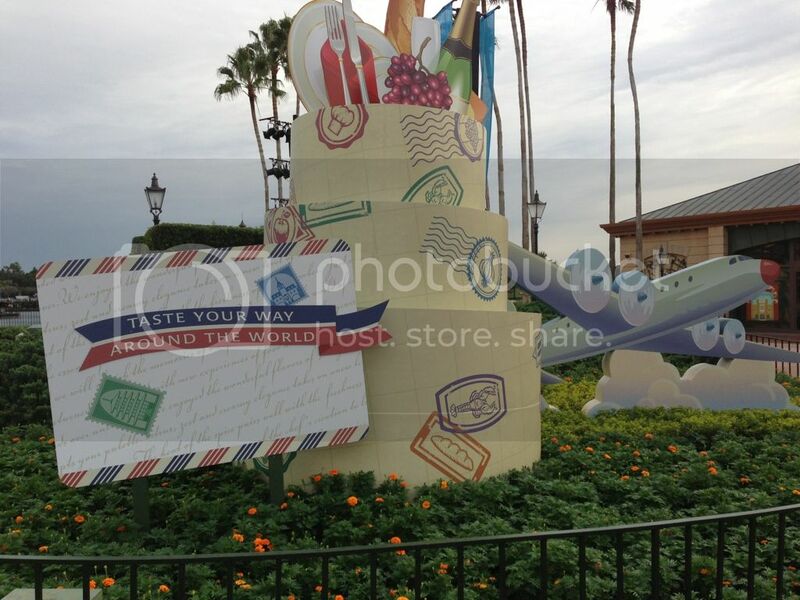 Here is another shot from the Epcot International Food and Wine Festival. This building was the Wonders of Life Pavilion from 1989 until 2007. Now, it is only used for special events. During this time of year it is known as the "Festival Center." It is a place where guests can get information regarding the Food and Wine Festival. There are also demonstrations, food and wine exhibits, and shopping found here. As great as the festival is, I'd still rather see Disney once again create a permanent attraction in this 100,000 square foot pavilion. The Astro Orbiter is the main focal point or "weenie" that guests see when walking from the hub toward Tomorrowland. Originally opening as the Star Jets in 1974, this attraction became the Astro Orbiter in 1994, during the major overhaul of Tomorrowland. The rockets travel at a rate of 11 revolutions per minute and they fly 1.2 million miles per year. I shot this on-ride video on August 11, 2012. Back in early September, I started taking panoramic pictures with a relatively new point and shoot camera, using a "stitching" effect in the camera's editing software. 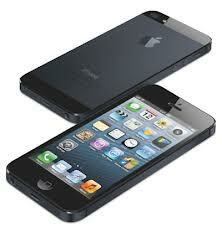 Since that time, I have been fortunate to have acquired the new iPhone 5. To say that I'm impressed with the camera quality would be an understatement. This phone takes great pictures and fantastic panoramas. These pictures are produced right in the phone without the need for additional software. I used the iPhone to take this shot of World Showcase Lagoon at Epcot, and I'll continue to use it to take panorama pics for Digital Disney World. Disney Outfitters is a large shop on Discovery Island in Animal Kingdom. I was giving a tour of this park last week and spent some time in this store. It specializes in jewelry, apparel, and art, but it is also full of great details. Like the other shopping locations on Discovery Island, Disney Outfitters is well themed. Its focus is on animals that travel in herds. This column of carved animals is in the center of the store at the main cash registers. There are four such columns on each corner of the checkout counter. Directly across from the towers of animals are painted compass directions in each corner of the room. The compass directions (N, S, E, and W) refer to the regions of Africa where the corresponding animals are found. These are the kind of overlooked details that make Walt Disney World so interesting. Since we celebrated the 30th anniversary of Epcot last week, I thought it would be appropriate to post a tribute to one of that park's classic attractions. Prior to Mission Space, that spot was occupied by Horizons. This picture that I took on Thursday shows a large flower planter in front of Mission Space. The planter is in the shape of the Horizons building. It was left there as a tribute to that great attraction. Although there is still more than three weeks left before the holiday, the Magic Kingdom is in full Halloween mode. I took this shot on Main Street yesterday. In addition to the decorations, the Magic Kingdom also hosts the "Mickey's Not So Scary Halloween Party" on many nights in September and October. There is trick or treating, a special Halloween parade and an amazing fireworks display called Hallowishes. I took this picture today, while giving a tour of the Magic Kingdom. 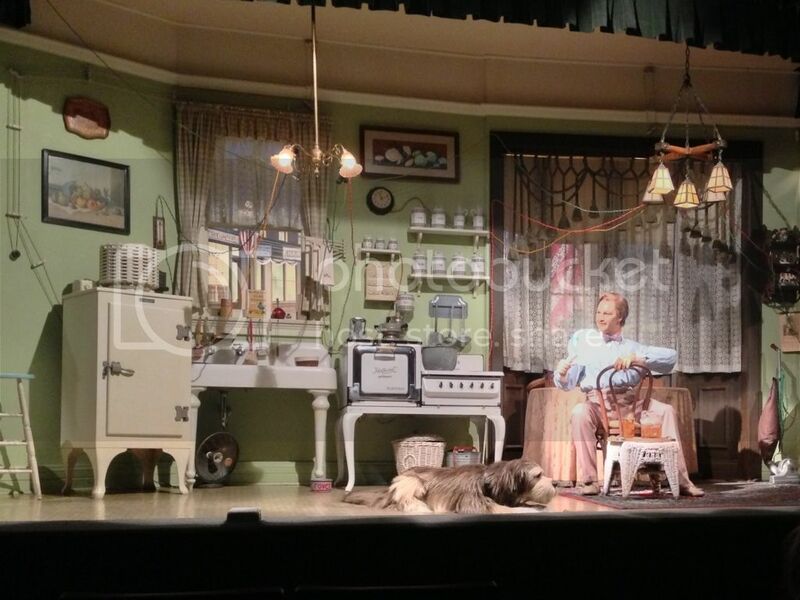 This is the 1920's scene of Walt Disney's Carousel of Progress. This classic attraction is one of the only ones in Disney World that Walt actually touched. It holds the distinction of being the longest running theater show in American history. While waiting for my guests today at Kilimanjaro Safaris, I was lucky to see this majestic sight. Every so often you can catch a gorilla in this area near the safari exit, and this guy was in front of a perfect backdrop. 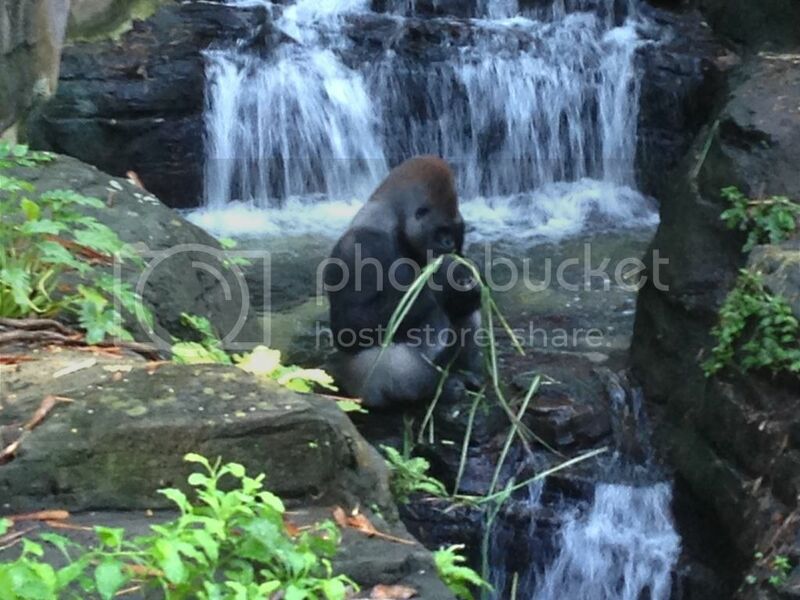 To see a gorilla in its natural habitat is something special. When you see them in a zoo behind glass or in a cage, it is kind of sad. Disney does an amazing job of creating areas that replicate the animals' normal surroundings. I took this shot of a brand new shop while giving a tour of the Magic Kingdom today. 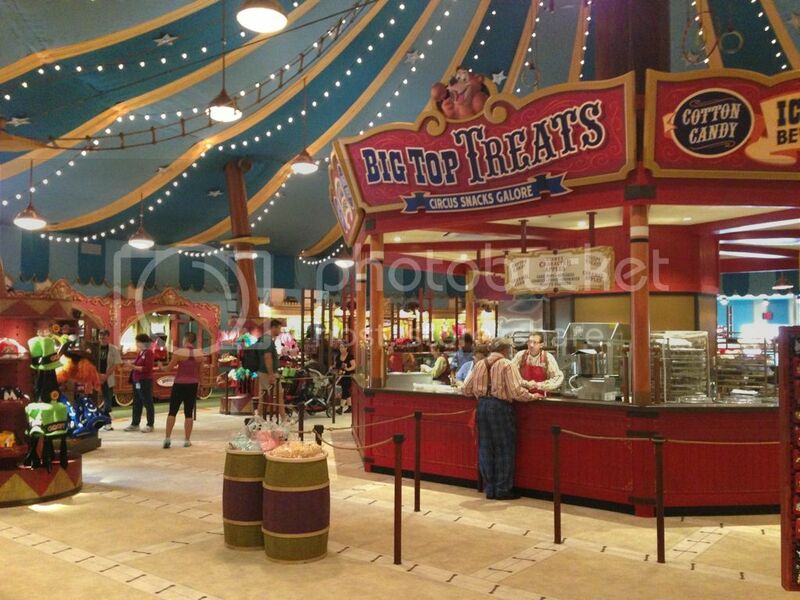 Big Top Souvenirs opened this past Sunday in Storybook Circus. It is an amazingly themed location with an interesting twist. They actually have a snackbar in the middle of the store that sells food you would find at the Circus. It is always fun to see Disney open something new! Along with Epcot's 30th anniversary, it is also that great time of year known as the International Food and Wine Festival. I took this picture today as I walked the promenade sampling delicious treats from around the world. This display is located right at the end of the main walkway from Future World, and it welcomes guests to the festival. If you haven't attended this event in years past, I certainly suggest doing it as soon as possible. This year the festival lasts from September 28 to November 12. Happy 30th birthday Epcot! Back on October 1, 1982, this amazing park opened with the name Epcot Center. One of the opening day attractions was The American Adventure. The building was inspired by Indpendence Hall, Boston's Old State House, Monticello, and Colonial Williamsburg. Inside the 108,000 square foot structure is a 1,024 seat theater where guests can see a moving tribute to American history. This is a show that is not to be missed on a visit to Epcot!